Rafi Saab has sung innumerable songs for top actors as well as other side actors, back-ground songs, etc. Rafiji also excelled in singing hit songs for Comedians. In fact, of all the Playback Singers, perhaps Rafiji has given the maximum hits to Comedians. Mehmood was one top comedian in the sixties to whom Rafiji has given the maximum songs. In fact, singing for Mehmood was difficult what with his typical Hyderabadi / Tamil Hindi in most of his films, but still Rafiji always never gave the feeling for the audience to differentiate between the on screen actor and playback singer. The first song which comes to anybodyâ€™s mind is â€œHum Kaale Hai To Kya Huaâ€ from GUMNAAM in which Mehmood also sang few lines. Very imaginatively picturised, this song was a craze in those days. Picturised on the same Zodi of Mehmood and Helen was â€œBadkamma Badkammaâ€ from SHATRANJ with Sharada. â€œKahun Kyaâ€ from GINNY AUR JHONNY had the same pair apart from â€œMain Hun Jaani Teraâ€ from Sunil Dutt â€“ Asha Parekh starrer BHAI BHAI. Mehmood and Shubha Kote were also a hit pair on whom â€œAjhuna Aaye Balamaâ€ was picturised. In fact this song if I am correct won a National Award. 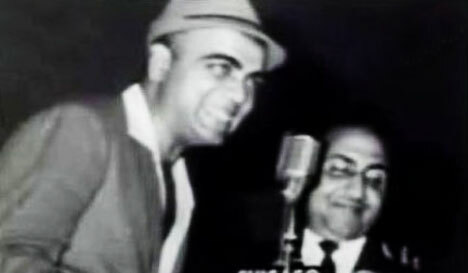 In the same movie SAANZ AUR SAVERA, Mehmood had a serious song â€œZindagi Muzhko Dikhade Rastaâ€. Another hit song was â€œO Gori Chalo Na Hans Ki Chaalâ€ from BETI BETE. Othe Rafi â€“ Mehmood songs were â€œParda Hatade Mukhda Dikhadeâ€ from Sanjay â€“ Padmini starrer, â€œMehabooba Mehaboobaâ€ from SADHU AUR SHAITAAN. â€œYeh Teri Sadagi â€¦â€¦â€¦ Taubashiqanâ€ and â€œMaine Rakha Hai Mohabbatâ€ from SHABANAM, which had Mehmood as hero. WARIS had a â€œMedley of hilarious songsâ€ from Rafi and Asha. â€œO Mama O Mamaâ€ from PARVARISH sung by Rafi and Mannadey was also picturised on Mehmood. â€œYeh Phurnur Chehraâ€ from MOHABBAT ZINDAGI HAI was also a super song. Rafi and Asha also sang for Mehamood and Moushami in EK BAAP CHE BETE. Singing for Jhonny Walker was much more difficult due to his peculiar voice. It is to Rafijiâ€™s greatness that he could sing so many popular songs for JW. â€œSar Jo Tera Chakrayeâ€ from PYAASA immediately comes to mind apart from â€œAe Dil Hai Mushqil Jeena Yahanâ€ from CID with Geeta Dutt. KAGAZ KE PHOOL also had â€œJeena Mushqil Marna Mushqilâ€ and SHAHANAI had â€œKitni Jawan Hai Zindagiâ€ picturised on both JW and Biswajeet. DUNIYA had a popular number â€œTu Hi Meri Lakshmi Tu Hi Meri Chayaâ€. In DOOR KI AWAAZ, â€œEk Musafir Ko Duniyameâ€ was a song hilariously picturised in a train. Though Mehmood frequently had Manna Dey in very many films as his Singer (Ziddi, Love in Tokyo, Bhoot Bangla, Poornima, Padosan, etc.) apart from KK (Bhoot Bangla, Kunwara Baap, Ginny Aur Jhonny, Lakhon Me Ek, etc.) and JW had Mahendra Kapoor (Kahin Din Kahin Raat), still it was Rafi who really suited both these great Comedians. The other great comedian of that era Rajendranath perhaps had only one song from Rafi â€œMeri Zindagi Tere Pyaar Meâ€ from JEE CHAHTA HAI, which incidentally was a serious song. Rafiji also sang for Brahmachari, â€œRekha O Rekhaâ€ in ADHIKAR and a â€œMedley of hilarious songsâ€ in EK PHOOL DO MALI sung by Rafi and Asha. â€œChali Chali Patanga Meri Chali Reâ€ from CHOTI BAHEN with Lataji as Co-singer was for Jagdeep. MAIN CHUP RAHUNGI also had a â€œMedley of hilarious songsâ€ sung by Rafi and Lata which was perhaps first of its kind in Hindi Film Industry. I understand once Jesudas, the famous Singer remarked that God was partial to Rafi Saab as he endowed Rafi Saab with all â€œKHUBIYASâ€ of a Singer. How true he was! Rafi could sing for heroes, side actors, comedians and even Villains with equal ease whether it was a romantic number, patriotic, serious, classical, Yahoo type, Lori, Bhazan, qawali, pop or any other type of song. No wonder even after 27 years, Rafi is loved, admired and worshipped. This entry was posted on Monday, December 10th, 2007 at 7:19 pm	and is filed under Meri Awaaz Suno. You can follow any responses to this entry through the RSS 2.0 feed. You can leave a response, or trackback from your own site. He was the one and only with a perfect male voice. He is will be remembered as long as the hindustani music is there. Post # 18, the film’s name is “Pushpanjali”. “Tuzhko Rakhe Ram” from AANKHEN was sung by Mannadey and Asha Bhonsle. dear gurumurthyji heartiest thanks for these nice efforts. i would like to add Rafi-Asha duet composed by Ravi from ankhen “allah ke naam pe dede international fakir aaya hai, tujhko rakhe ram tujhko allah rakhe” picturised on Mehmood and Mala Singha. And “jungle mein mar nacha kisi ne na dekha hune todi si peke jhooma sabne dekha” from Madhumati composed by Salil Chowdhury picturised on jhoney walker. My e-mail id is hvguru@bhelepd.com or hvgurumurthy@yahoo.co.in. Dear Gurumurthy Ji, Mr. Ghulam Mujtaba from Lahore who has been airing his comments in these columns had actually sent an email to me, thinking it to be you, attaching some very good photographs. I tried to send it to you at your email id hvguru@bhelepd.com but it bounced back. please therefore forward your email id once again either here or at asmurty2@rediffmail.com so that i can forward the same to you. i have also advised mr. ghulam mujtaba about this and he too may write again in these columns on the subject. all the best. Please note my e- mail number “mujtaba@samintextile.com” Cell # 0092-300-41762259. Will send you some rare pic. of Mohammad Saddiq Sahib taken in the eve of Annual classical festival conducted in Lahore in November 2007 with your Salim Ghous Sahib, specially came from Bombai invited by Usman Peerzada Sahib, Salim ghous Sahib is best friend of Binu Nair Sahib. his tel. number # 0091 (0) 22-2636 9389 / 26317825 You can ask about his first meeting with Mohammad Siddiq Sahib in Lahore. Special thanks to shri shirish kulkarni. (will talk on cell with M. Siddiq Sahib on 18th or 19th December 07 as the matter was disucssed I shall be most grateful if Guru Murthy Sahib will participate in discussion with Respected Siddiq Sahib). Pl confirm me by SMS on my Cell number. Dear Mr. Ghulam Mujtaba Sahab. I have just now spoken to Shirish Kulkarni and learnt about you. Also, Mr. Souvik Chatterjee, as you have mentioned elsewhere, is not only a good writer whose articles i always like, but also a good friend of mine and we are also on regular contacts. I would like to speak to you, but i do not have an international dialing facility both from my mobile and landline. shirish kulkarni would mail to me your phone numbers though. however, please in the meantime, do give me a mail at asmurty2@rediffmail.com so that we can begin some interaction. we are all very happy in india to learn that you stay right across where rafi sahab used to live in lahore and that rafi sahab’s brother and family are your close acquintances. please convey our regards to all of them. pls do get in touch with me. thanks. Thank you very much for your correction this song was picturised on Joy Mukharji – I would inform your goodself that I am leaving near Rafiji’s old residence when they came from Kotla Sultan Singh. Now his younger brother Mr. Mohammad Sidiq is living with other Rafiji’s brothers and their kids. I have sent some pictures thru e-mail to respected binu nairji and it is pleasure for us that they have published in Sargam Magazine. The family members are paying heartiest Salam to all writers / participants. With warm regards. Ghulam Mujtaba. Great Article and I want to know about the song â€œParda Hatade Mukhda Dikhadeâ€ is it the song from ek pool do mali which picturized on sanjay khan ? (ye parda hatdo zara mukda dekha do). Tere pojan ko baghwan banaoun bank main aali shaan, a bajan type comedy mohd rafi sang for Om Prakash. This wonderful web site has enabled a man from Lahore in Pakisthan to interact with a man from Bangalore in India, clearly showing that Rafi had his fans across the Globe. Well, the song “Duniya Pagal Hai” was not picturised on I S Johar but on Joy Mukherjee. Even the other song of the film SHAGIRD – “Bade Miya Deewane” was on Joy though I S Johar comes out with few words throughout the song and few lines at the end in Mannadey’s voice. I am now 58 years and from my childhood listening the songs of Rafi Sahib, I could not find yet a versatile singer like him. His voice range is incomparable. In Bagu Bawara ” Ay Dunya kay Rukhwalay……….” no imitator dares to copy that song. Would that he lived longer to leave more treasure of his ever lasting songs. I give Mr.Naushad Ali credit to make him such a great singer, followed by S.D.Burman and Laxmikant Piyraylal. I am Ghulam Mujtaba from Lahore. It is a wounderful and informative article towards all comedians who got success with Rafiji special melodious voice exclusively falls thereon. However, Rafiji have sung a song which was picturised on I S Johar: Dunian pagal hey Yaan Phir Mein Diwana Film Shagird. I am very impressed with the latest informations from the Articles written by Respected Souvik Chatterji specially on Rafiji, Shami Kapoorji and Shanker Jaikishanji. My heartiest Salam / Namasthy for his dedicated articles which he wrote in depth for each legendery Singer, Actor and Music Directors. Special thanks once again to Mr. Souvik Chatterji. thanks for drawing the attention of viewers towards the dynamic dimension of Rafi. I have mentioned my father’s interview with Milon Gupta, the person who played the mouth organ in CID. He said Rafi’s song for Johny Walker “ai dil mushkil jeena yaha”not only had comedy impulse was melodious and ended up being a greater hit than the song he sang for Dev Anand in the same film titled “ankho hi ankho me ishara ho gaya”. Can you please send me the song ‘kasmir hain bharat ka’? Interesting article by Mr. H.V. Guru Murthy, Rafi Saheb sang for all comedians with ease and feelings, Mehmood and Jhonny Walker were lucky for getting Rafi Saheb singing for them. Main marne chala hoon… nicely picturised on Mehmood from the film “Gunahon Ka Devta”. Interestingly, his first recorded song in hindi “aaj dil kaboo me ho to dildaar ki aisi ki taisi” was also a comedy song……………..
Great topic of discussion. Perhaps it is believed that comedians can play serious roles equally well. A classic rendered by Rafi Saab for Mehmood “Saj Rahi Gali Teri Maa” in Kuwaara Baap is remembered till date. Rafi has sung many songs for Asrani in the 70s as well. To add a few songs for Johnny Walkar “Jane Kahan Mera Jigar” ; “All line clear” ; “Mein Bambai Babu”; etc. An all time comdien in regional Punjabi films Mehar Mittal as has many songs to his credit sung by Rafi Saab. Same hold true for I S Johar as well. Rafi Saab has sung many comedy songs in Punjabi also with Balbir. Bohut Khoob Gurumurthy Ji, this one was surely expected from you. I had always wondered what took you so long to write this beautifully crafted article while all the material was always there with you. anyway better late than never and i enjoyed the article very much. sure no one to beat Rafi sahab when it comes to playback singing for these comedians who were an integral part of our cinema in the 50s, 60s and 70s. Perhaps rafi sahab has also sung for Junior Mehmood and also for Jagdeep may be, though i cannot recall those songs unless someone like you and other knowledgeable readers point out. But i am simply stumped with rafi sahab’s hyderabad accent for the song “mehbooba mehbooba, banado mujhe dulha, jalado mera choola” for Mehmood. That kind of accent though very typical of a hyderabad is so very difficult for even a hyderabad like me. and i know for sure many from urdu background families cannot produce that strange twist of words and accent that rafi sahab has given out in this song. there is not an iota of difference from the actual colloquial language that is presented in this song. apart from the costume of mehmood with a t-shirt and a lungi to match, the accent in the song truly depicts a hyderabadi to the hilt. good job of writing this piece. kudos.